Nine of San Francisco’s homeless chihuahuas were treated to a red carpet and first class flight treatment this morning -- a swankier ride than most of us will ever experience. The little guys flew from San Francisco International Airport to Newark Liberty International Airport in New Jersey as part of Virgin America’s fifth Operation Chihuahua airlift, a special flight started in 2010 to address San Francisco’s overpopulation of the teacup dogs. They'll be sent to East Coast shelters, where apartment-dwelling New Yorkers are more likely to adopt them. “We’re so pleased to again help our friends at the San Francisco Animal Care and Control who do such important work to care for animals in need in our community,” John MacLeod, SVP of Planning and Sales at Virgin America, said in a press release. The airline’s headquarters are based in the nearby Bay Area town of Burlingame. 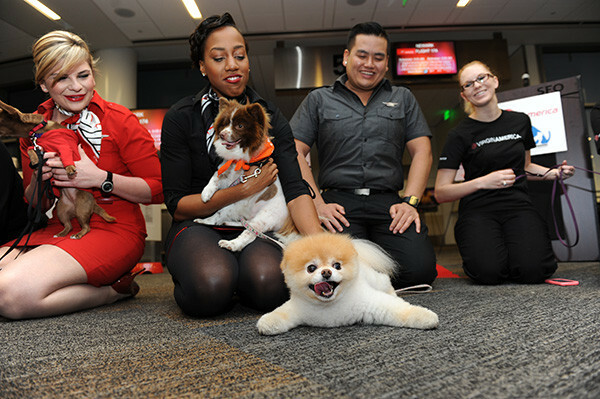 To welcome the pups on board, Boo, “World’s Cutest Dog” and Virgin America’s official pet liaison, hosted a red carpet send-off. On board, the chihuahuas kept busy with toys, snacks, live TV and “chi-mosa” cocktails. The overpopulation of chihuahuas in San Francisco has been a localized phenomenon for years. When Virgin America launched Operation Chihuahua, the tiny canines made up one-third of shelter dogs and were showing up in droves of up to eight a day -- a stark contrast to the rest of the country, where pit bulls dominate the shelter population.